Is this Amazon's game console controller? 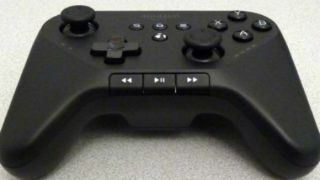 What appears to be an Amazon Bluetooth gaming controller has just surfaced online, as rumours of Amazon's set-top box continue to hot up. Two analogue sticks, four face buttons, a D-pad, trigger and shoulder buttons all adorn the Xbox-esque gamepad, but it's the buttons in the middle of the controller that have caught our eye - those are Android icons. Apart from the bottom-middle one, of course, which looks an awful lot like the Amazon GameCircle logo. On the bottom sit some buttons for media playback - play/pause, rewind, fast-forward - and there are LED indicators for... something... on both sides. According to Zatznotfunny, which picked up the pictures from Brazilian regulatory agency Anatel, the controller will be sold as an accessory and won't actually come bundled with the box. If true, that suggests Amazon's box won't have gaming as its central focus and will likely be a more rounded streaming system. The gamepad will also be powered by a pair of double A batteries and will allegedly work with Kindle Fire tablets. Our opinion? It's not much of a looker. Not much else is known about Amazon's box for the time being, but given the proliferation of leaks and rumours, we expect we'll hear something official very soon. But could Amazon be making a big mistake?